This is a booking service for our Canteen area - the table service dining section. If you'd like to book for a buffet or to reserve a drinks area, please telephone your local HA! HA! (you'll find contact details on the bar profile page). To make a dining booking please complete the form below. Your booking will be confirmed ONLY when the bar has contacted you by telephone! The deadline for booking is midday, that day, for lunch or 6pm, the same day, for dinner. The manager will call you to confirm your booking as soon as they have received the email. Please check out any restrictions to age or disability access before booking for the bar - take a look at the bar's profile. 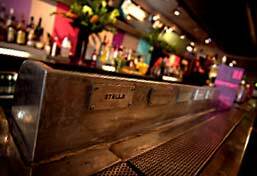 If you don't receive a phone call confirming your booking then it means we haven't got your email - there may be a computer melt-down at the bar... it hahapens! If in doubt, just give us a call.